If it's alright with you folks, I'll review the coffee that is produced by percolating hot water through these coffee beans, rather than the coffee beans themselves, as I have never eaten the beans au naturale, and I imagine you don't intend to either. Well, at first glance, you can be pretty certain this stuff's from Hawaii. I'm sure they wanted to dress each can in its own button-down Hawaiian luau style shirt, but decided that would unnecessarily raise the cost of the product. So instead, they just covered the label with stereotypical Hawaiian flowers, palm trees in the background against a lovely orange Hawaiian sunset. Legend has it this beautiful cove is where some of the writers of "Lost" hid after the final episode aired to avoid the wrath of disgruntled fans, furious about that cop-out ending to the series. Kauai is indeed the northernmost of the Hawaiian Islands, and they apparently grow the best coffee beans there...on the "leeward" side of the island. To save you from Googling "leeward definition," like I had to, I'll go ahead and let you know that "leeward" is a nautical term meaning "the direction in which the wind is blowing." The can boasts that these medium-roasted beans are "aromatic, earthy, and sweet," and that's exactly what they are - or rather, what the coffee derived from these beans is. I'm not used to coffee being so bold, and yet so sweet. There's usually an unpleasant bitterness that I need to cover up with cream and sugar in any "bold" coffee. Not so with this magical island blend. I imagine the beans were grown and harvested by the Menehune's themselves - that's part of what gives the coffee such unusual properties...oh, no wait...it's the volcanic soil, according to the can. 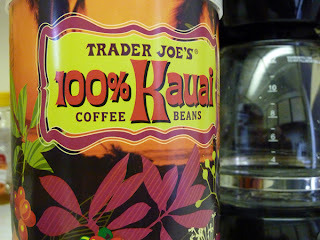 But of course, Trader Joe's can't claim publicly that they're exploiting the Menehune's. So it's probably both. Both volcanic soil and magic from the Menehune's. The Menehune's were on that episode of "Full House" where Danny Tanner took the whole fam to Hawaii; that's how I know about them. Man, that show ended way better than "Lost" did. I'm really bitter about "Lost." That whole debacle really tainted my feelings about Hawaii. But, thankfully, this coffee is among the things that are restoring my opinion of our great 50th state. Remembering that episode of "Full House" didn't hurt either. Anyway, the coffee is good. 4 from me. 4 from Sonia. Bottom line: 8 out of 10.